Blueberry Ln. is a Chicago-based web development agency founded in July 2000. Our team provides clever solutions to small and medium-sized businesses in a variety of industries including legal, healthcare, e-commerce, hospitality, and DIY home improvement. We can help with your project, no matter the size or complexity. We can provide full strategy and execution, or simply handle the development. Whatever makes the most sense to you. Take a look around our portfolio and you’ll get an idea of our best and most recent work. Built on Wordpress - XHTML/CSS and jQuery. 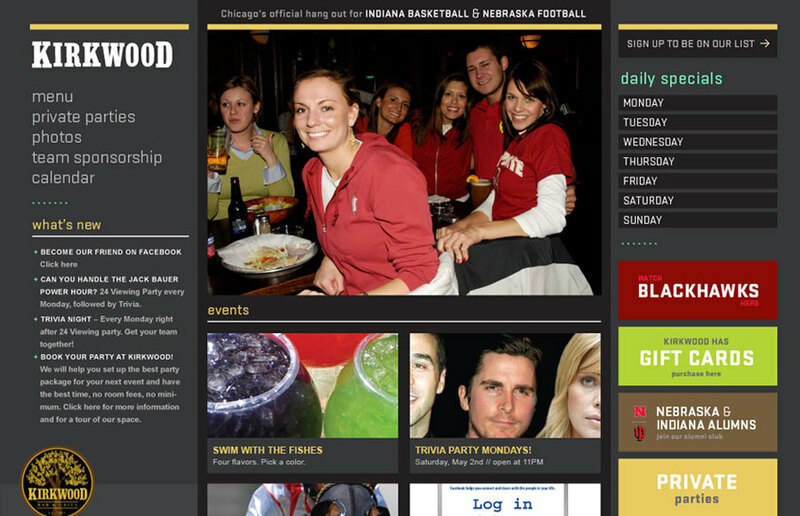 Kirkwood (local bar and grill) is able to easily manage their daily specials, menu, event calendar and other features behind the scenes of their brand new site.